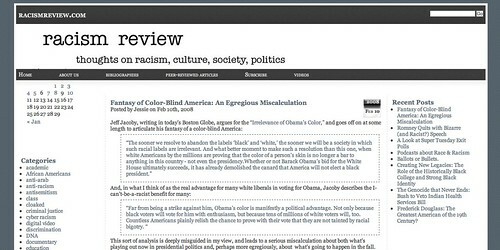 Racism Review is a great blog that provides provocative commentary on the racism ingrained in our current culture. It is maintained by Joe Feagin and Jessie Daniels. Occasionally, guest bloggers post (I assume they are graduate students). As a masters student who is studying the sociology of higher education, this blog is a useful tool in constructing racism's role in our society as it relates to higher education. Considering Joe Feagin is an esteemed sociologist, this blog is an invaluable resource to individuals interested or studying our inherently racist culture. Racism Review is at the top of my daily reading list and it should be for you.